Further planning meetings followed and some important decisions were taken: the new organisation would be named The Stafford Jazz Society; the opening jazz night would be on 9th December 1981 and would feature Roy Williams supported by local jazz musicians; the Society would join the Stafford Arts Council and in the first “Rules” drafted for the Society its aim would be: “to promote and sustain an interest in jazz”. Having succeeded in his objective to form a jazz club for Stafford, Phil Brewin stepped aside, was made an Honorary Member in recognition of his achievement, and Steve Deakin became the Society’s first Chairman. Naturally enough, given these origins, the concert venue in those early years was, and for almost 25 years remained, the Gatehouse Theatre. At first its Cabin Studio Theatre was used, and then later the Globe Tavern. I first joined the Society as its Publicity Officer in 1989 having been invited to take on this role by its then Chairman John Moore. The Society at that point was visibly struggling and I can well recall concerts at which the musicians outnumbered the audience. Around six Midlands-based bands played for the Society at that time but as more bands were invited, some of them well-known on the national jazz circuit, audiences quickly began to increase. To accommodate this growing support the Society moved into the larger Mountbatten Suite with its adjacent overspill Churchill Room. And for the Society’s occasional Jazz Festivals, even the main theatre stage was used. The relationship between Stafford Jazz Society and the Gatehouse was and always will be special for it was in that building where the Society was founded and where for almost a quarter of a century, live jazz concerts brought a multitude of happy, lasting memories! So why you might ask, does the Society not use the Gatehouse Theatre now? As with most things it came down to money and politics! During those years the Society had enjoyed many tangible benefits at the Gatehouse: free use of the theatre venue; free use of one of the theatre technicians to provide both sound-desk and technical support and free use of a theatre piano whenever it was needed. In 2005 this was all to change! The prevailing Council as part of its budget strategy needed to generate income. As part of that process, Gatehouse Theatre hire costs were proposed for each of the Jazz Society’s previously free benefits. The two rooms would, under the incoming charges cost us £88/76 per week, the technician and sound-desk £78/20 per week and the use of the piano £28/85 per week! By that token, the weekly charge to Stafford Jazz Society would escalate from zero to just a little short of £200 per week, and, spread over a typical concert season would amount to over £6,000! My subsequent negotiations with Council Officers – I had been elected Chairman in 1995 – yielded what would have been but a very temporary respite. The charges to be levied were viewed by the Committee as not only unaffordable they threatened the very future of the Society. The decision to relocate to another venue was sadly but inevitably taken. 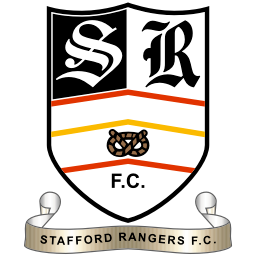 The Society moved to Stafford Rangers FC Social Club. Why are the Society’s regular concerts held on Sunday lunchtimes? This has not always been the case. The 1981 Committee decided that concerts would be held on Wednesday nights and at some point after that, jazz night was changed to Thursdays. Records for that period suggest evening concerts struggled to attract sufficient audiences and at some point in the mid-80s the concerts moved to Sunday lunchtimes. 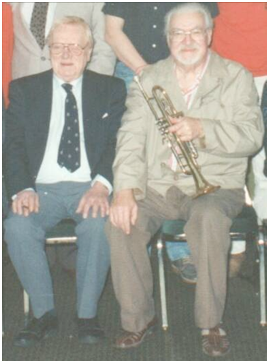 Although many people have helped to steer and support Stafford Jazz Society over the years special mention must be made of two gentlemen of distinction: John Moore who was the Society’s Chairman from 1982 to 1995 and well-known bandleader Ken Rattenbury MA who was its President from 1990 to 2001. Our Band of the Year and Musician of the Year annual awards commemorate the outstanding service and achievements of these two Stafford Jazz Society stalwarts. JSomeone else who deserves an accolade is Frank Nichols. Known to most as a highly talented reeds player, Frank is also a supremely gifted artist and graphic designer and when the Society was in need of a new logo to re-brand itself in the 1990s, it was Frank Nichols who created our unique saxophone shaped logo that has been so greatly admired by the wider jazz community. He also painted our beloved portrait of Louis Armstrong so proudly displayed at our concerts. in our repertoire. As our venue was then the Gatehouse Theatre’s Globe Tavern I christened the band The Globetrotters Jazz Band and Frank quickly came up with a logo. 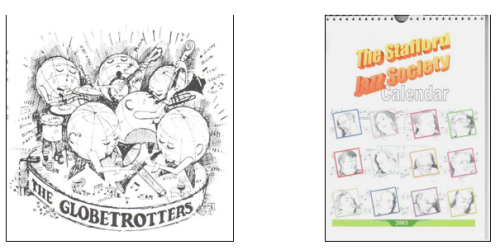 In 2003 he even created a Calendar for the Society with 12 hand-drawn portraits of some of our regular concert performers. 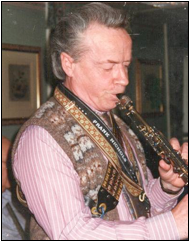 And no history of The Stafford Jazz Society would be complete without mentioning a British jazz legend, the late, great Nat Gonella who became a distinguished Life Member. Whenever I brought him to Stafford from his retirement home in Gosport he delighted both bands and audiences when he sang. The Society is very proud and feels very privileged that he associated himself with us so closely during his retirement years. Nat Gonella in full flow watched by an admiring Mel Hill (who became SJS President in 2001) & in 1996 receiving a Stafford Jazz Society 15th Anniversary Mug at his Gosport home from Nick Balmforth. Mel Hill (shown above) who has done so much for jazz in this region and beyond, both as musician, band leader and as a jazz presenter for the BBC, was elected SJS President in 2001 following the death of Ken Rattenbury and he continues to be our figurehead to this day. 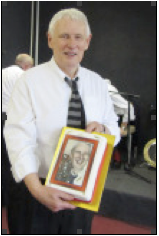 When Mel retired from leading the front line of the Old Fashioned Love Band at a Stafford Concert in February 2014 he was presented with a Celebration Cake bearing his own portrait to mark the occasion. 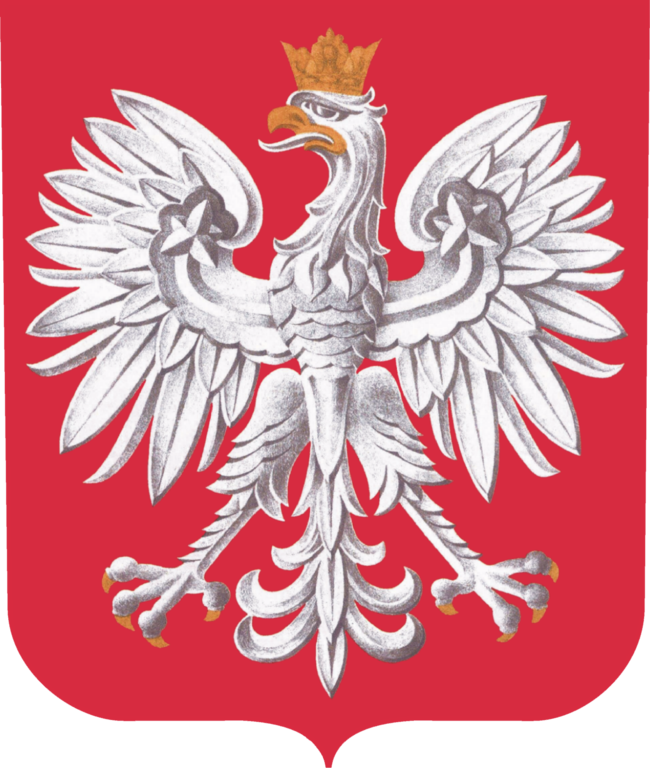 Moving fast forward to 2014 – our next change of concert venue, to the White Eagle Club, was not anticipated. The Society was not looking to relocate at that time although there had been some expressed concerns about our venue. The move came as the result of an invitation by the Stafford & District Polish Association following a Presentation I gave about Stafford Jazz Society to the Stafford Tourism Bureau earlier that year. The invitation certainly resonated with our Committee and subsequently bore fruit for this reason: Stafford Rangers Football Club had suffered successive relegations in non-league football; there had been recurring front-page stories in the local press about the Club’s financial difficulties and its uncertain future and against that background the Society’s long term future at that venue had seemed to the Committee to be shrouded in doubt. By contrast, the White Eagle Club was deemed to offer more modern, inviting and spacious facilities, to be more accessible by public transport and, importantly, to have a more sustainable future. Negotiations successfully completed, the decision to relocate was unanimous. Over the years Stafford Jazz Society has received generous financial support from: Stafford District Arts Council; Stafford Borough Council Arts Development; Staffordshire County Council Arts & Museums Service; Staffordshire Building Society; the Awards for All Lottery Programme; the Staffordshire County Council Local Members Initiative Scheme and from a number of local industries and private benefactors. Among these was Clive Weatherer MBE, a blind Stafford businessman who loved jazz and who had been both a Member and a Committee Member for most of the Society’s existence. We commemorate his memory with the Member of the Year Award Trophy presented each year at our Christmas Concert. CHistorically, and to this present day the Society has been pleased to enter into partnership with the Council and with other organisations to provide: Jazz in Stafford’s Victoria Park, Jazz at Stafford Castle, Jazz in Stafford Town Centre, Jazz Gospel Services at Stafford’s St. Mary’s Church, Jazz & Poetry Concerts and Jazz in Stafford’s Annual Music Festival. 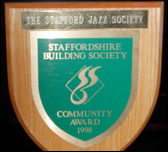 · In 1998 the Society was a Winner of the Staffordshire Building Society’s Community Award and was presented with a Commemorative Shield to mark that achievement. · From 2001 to 2009 the Society, thanks very largely to John Ollier, organised an annual Staffordshire Youth Jazz Festival for students at the county’s schools, colleges and music centres giving valuable performance experience to rising musical talents. 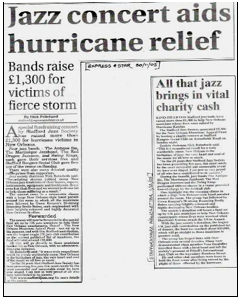 · In 2005, following the devastation caused in New Orleans by Hurricane Katrina the Society’s Charity Concert in aid of the New Orleans Musicians Appeal Fund raised, with the generosity of some of our regular jazz bands, a little over £1,300! 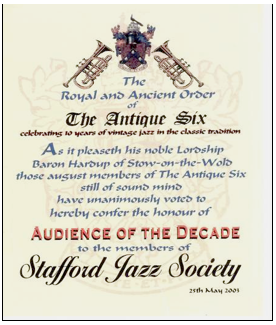 · In 2003 the Society received an “Audience of the Decade” Award from that popular jazz band The Antique Six. The Society has always had appreciative, listening audiences and musicians enjoy the respect shown to them. In its concert programming since 1981 Stafford Jazz Society has been pleased to feature foreign bands & musicians from the USA, Holland, Russia, Sweden and Australia. Jazz is truly a genre of music that knows no national boundaries and it has been good to “go international” when the opportunity has arisen to include in our programme visiting bands and musicians from abroad. 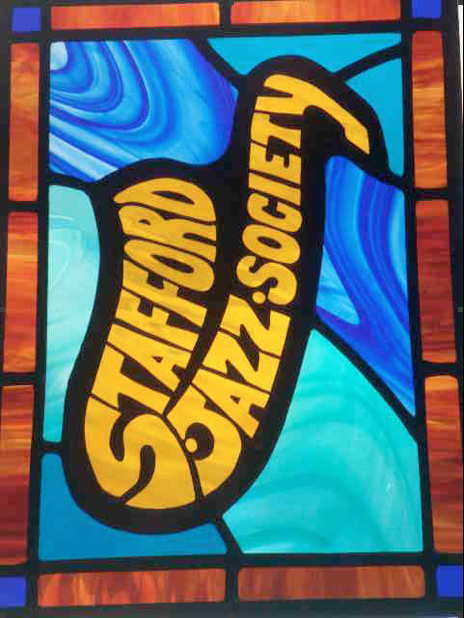 To conclude: Stafford Jazz Society is probably one of the oldest jazz clubs in the country, having been presenting live jazz concerts continuously now for over 30 years. During that time many other jazz clubs have fallen but not only are we surviving we are deemed by both our audiences and musicians alike to be thriving! I often say we are a “preservation society keeping alive an endangered species of music” – long may we continue to do so! I hope this short, unfinished history gives both an appreciation and an understanding of our roots, and does some justice to our milestones and our achievements. 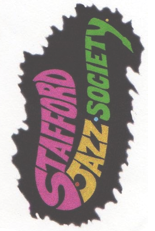 And I hope you continue to support Stafford Jazz Society so that yet more chapters can be added to its proud history and, most importantly, may we all continue to keep live jazz alive in Stafford!